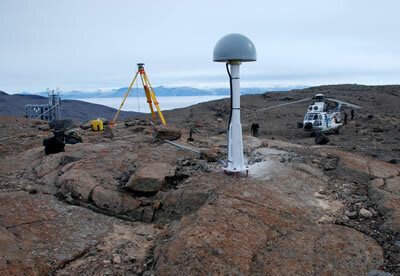 Nine continuous GPS stations were installed in Greenland as part of POLENET Greenland (GNET) during the May and July 2008 field campaigns. Communications for two stations installed last year (2007) were repaired and brought back online. Data from these sites are transmitted via an Iridium modem to the Boulder Facility network, where it is archived automatically. Currently there are 34 stations in the GNET network. Installation of another 8 stations is planned for the final season next year. The project is part of the International Polar Year (IPY) and the international POLENET consortium between Denmark, Luxemburg, and the USA (for Greenland only). The project's goal is to determine the vertical velocity field associated with ice mass changes. The results will be used to correct satellite measurements made of the Greenland Ice Sheet. 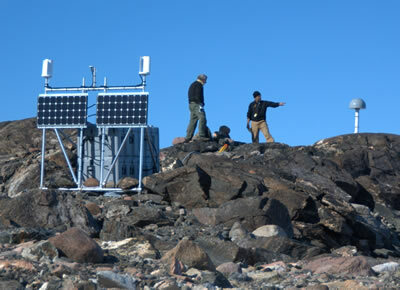 Figure 2 - GPS site located at Blaasor, which is in NE Greenland. In the back is a Super Puma helicopter used to transport the equipment to the site from Station Nord.